Last month when I ordered a selection of brown ink samples from the Goulet Pen Company, I threw a few black ink samples into my shopping cart, too. The basic black Lamy cartridges I’d been using were, well, basic enough, but nothing to write home about. I had also been using some black Montblanc bottled ink that I happened to have, which washes to a strange purplish-tan hue, so I decided it was time to replace those inks with a better black. My lime green Lamy Safari is now filled with a sample of Private Reserve Ultra Black (fast dry), which I’m finding to be a rich, neutral black with a slightly cool, mostly neutral wash (the scan of my sketch, left, makes the wash look a little cooler than it is) – which is exactly what I wanted, so this might be my black ink of choice. (As a lefty, I thought the “fast dry” aspect would be helpful, but so far, I haven’t noticed that it dries must faster than other inks.) I have two more black samples to try – Diamine Jet Black (which washes cool) and Private Reserve Velvet Black (which washes with a reddish-tan undertone similar to the Montblanc). My dip pen tests indicate that I won’t like them more than the Ultra Black, but I might still fill a Lamy with them eventually. 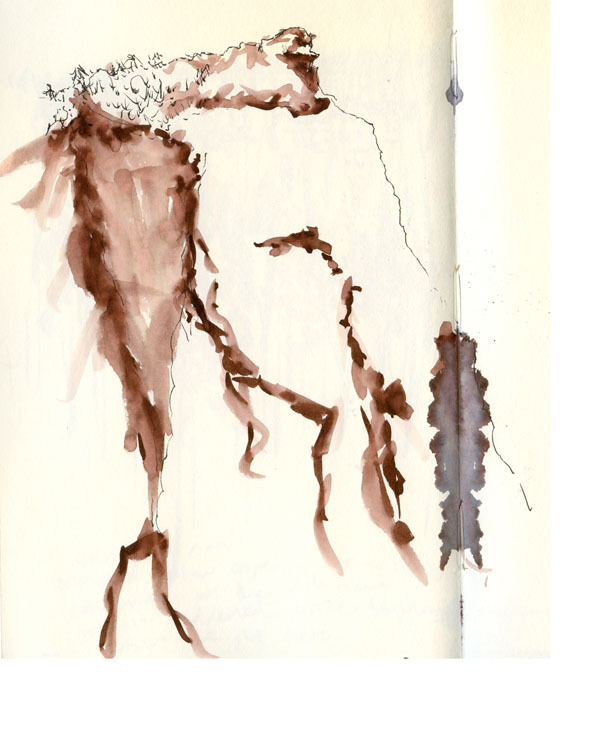 Speaking of inks, Stefano has been experimenting with brown and black inks that he has combined into a custom mix. I have several brown ink samples that I already know I’m not fond of just from dip pen tests, so they will probably never fill my pens. I’m thinking I might mix a few together and see what happens. Heck, maybe I’ll throw in some black, too. Other than some recent blind contours, I haven’t done many self-portraits lately. After drawing more than 100 of them earlier this year, I got a bit burned out. 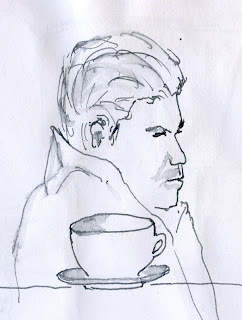 But now in Anita Lehmann’s drawing class, we are studying faces, and the homework assignment yesterday was to draw a portrait, either live or from a photo. Most of my earlier self-portraits were done by looking in a mirror, so for the homework I chose a photo. 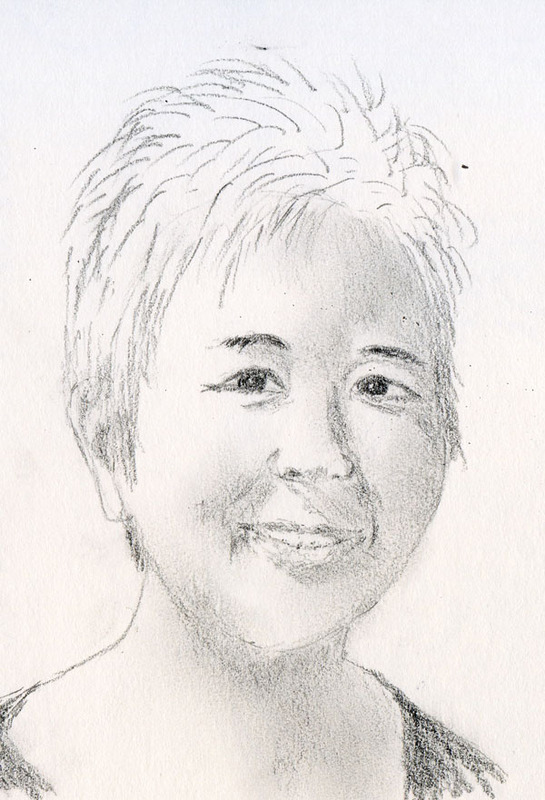 Although using a dry medium like graphite or charcoal is generally recommended for portraits, oddly enough, this homework assignment may have been the first self-portrait I tried in pencil. When I gave myself the assignment to draw 100 self-portraits, I knew I would get bored if I didn’t entertain myself with color, so I used a lot of bright markers and even paint for most of them. But now that we’ve been working almost exclusively with soft pencils and charcoal in Anita’s class, I see the value (pun intended) in using black only and a soft medium that can be smudged easily for shading facial contours. 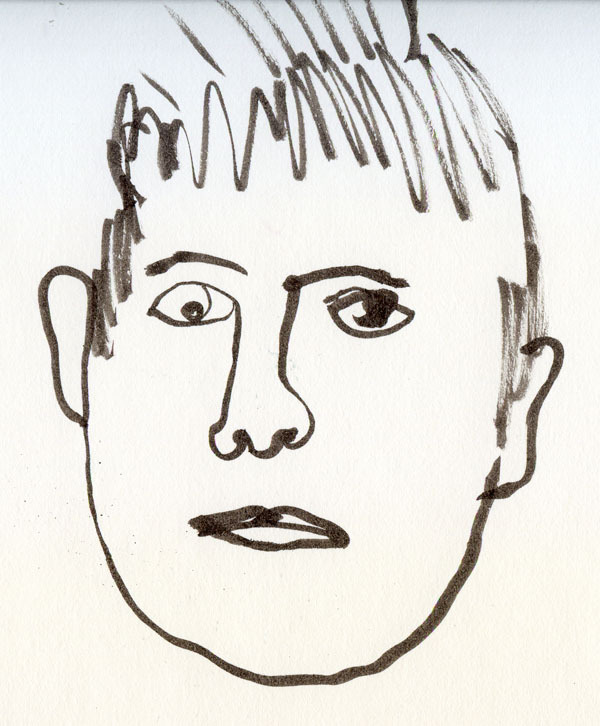 Here’s the test: If I use this self-portrait as my Facebook profile picture, will my friends recognize me? 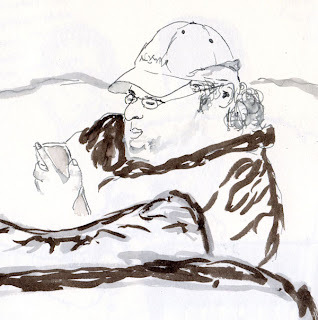 It’s frustrating being an Urban Sketcher when the weather isn’t hospitable for sketching outdoors. 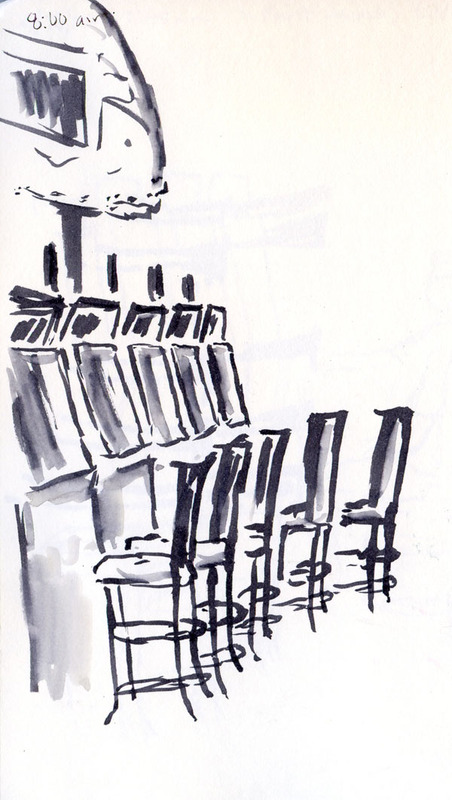 I’m trying to find public interior spaces where I can sketch, but so far, I haven’t come up with many (Northgate Mall is one, but it’s an inspirational last resort). Any ideas? Note to self: Don’t think you can evade perspective issues by running indoors! Exterior architectural perspective is hard enough, but it may be even more challenging indoors where it’s difficult to get sufficient distance to see the horizon line and vanishing point. As I’ve said before, the long winter ahead will give me plenty of practice. ﻿Question: What’s the most important element of human figure drawing – the one thing that if you get it wrong, everything’s wrong? ﻿﻿﻿﻿﻿﻿﻿﻿No, it’s not something I learned in a figure drawing class, but it’s the answer I keep coming up with in Gage’s figure drawing open studio sessions as well as in coffee shop figure drawing open studio sessions. After an hour-and-a-half of sketching a model in various poses and lengths of pose, I think I finally got the proportions mostly correct in this 10-minute pose (model on the right). 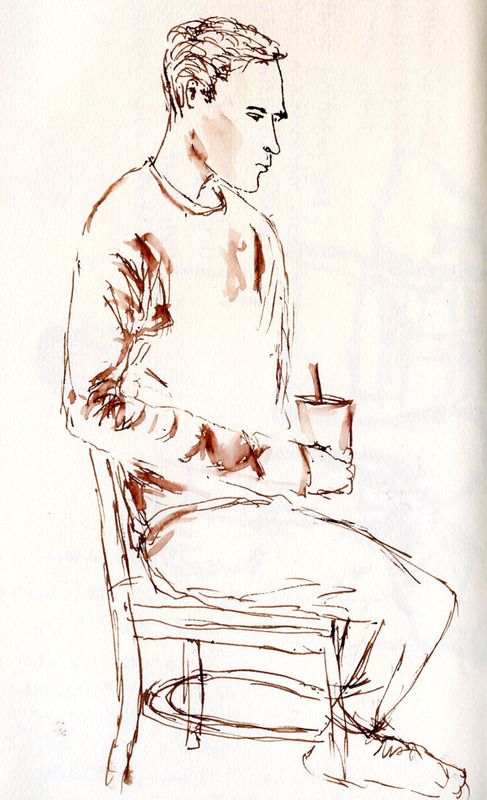 But a few hours later at Starbucks, look what happened to my hapless “model” on the left when I tried to squeeze his legs onto the sketchbook page. Glum as the gray and drizzly weather, I knew a quick stop at the Woodland Park Zoo’s Willawong Station would cheer me up. I had recently picked up the zoo’s winter brochure, which highlighted all the places you can visit at the zoo without getting rained on – encouraging information for the long winter ahead. Other than staff putting up holiday lights, the zoo grounds were mostly deserted, and I had Willawong Station to myself. Inside, it always feels like a humid summer day, but the birds must have known it was cold and rainy outside. 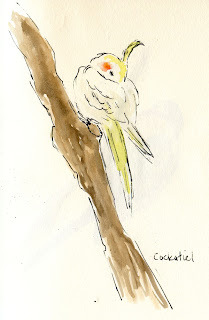 I’ve sketched the eastern Rosellas and cockatiels before when they were more lively; today they seemed to be hunkering down for a nap. Even so, their bright colors cheered me up. 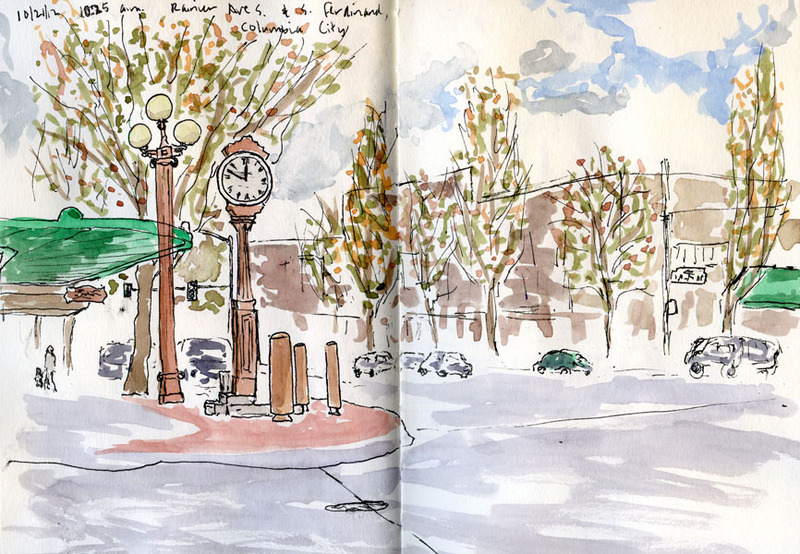 Sunday’s sketchcrawl was a stroke of weather luck; shortly after I got home that day, it started raining (sleeting, actually! ), and it hasn’t stopped since. 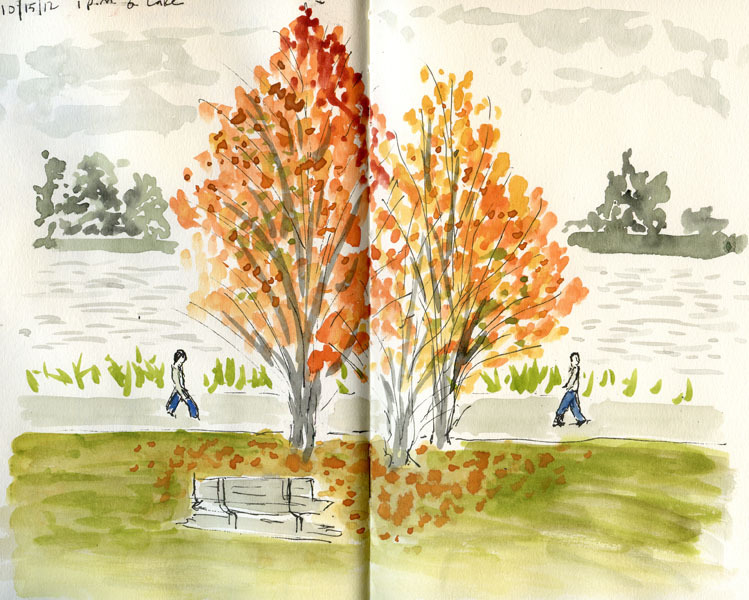 Needing a dry place to sketch, I headed for the Green Lake Zoka. 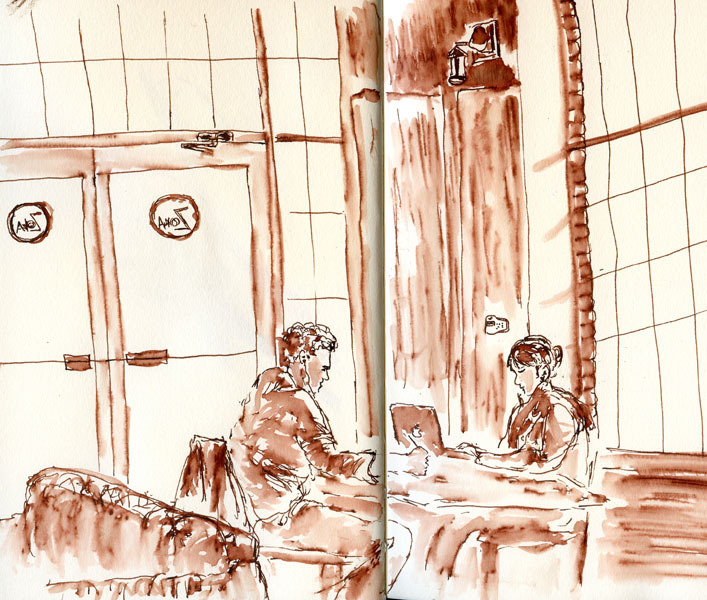 After a few head sketches, I realized that I’ve lost my coffee shop sketching mojo. 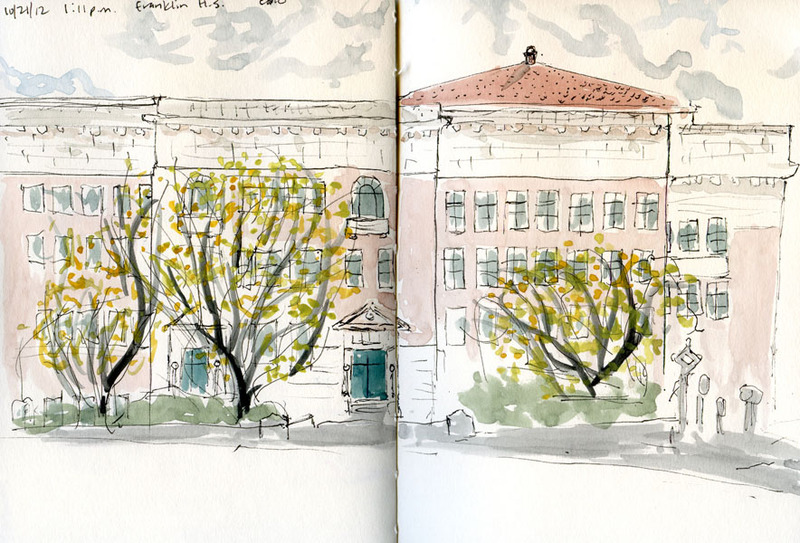 All those urban sketches that filled my sketchbooks during the summer improved my skills with drawing architecture and trees. And all the musical performers I sketched at farmer’s markets helped me with figure proportions and action. 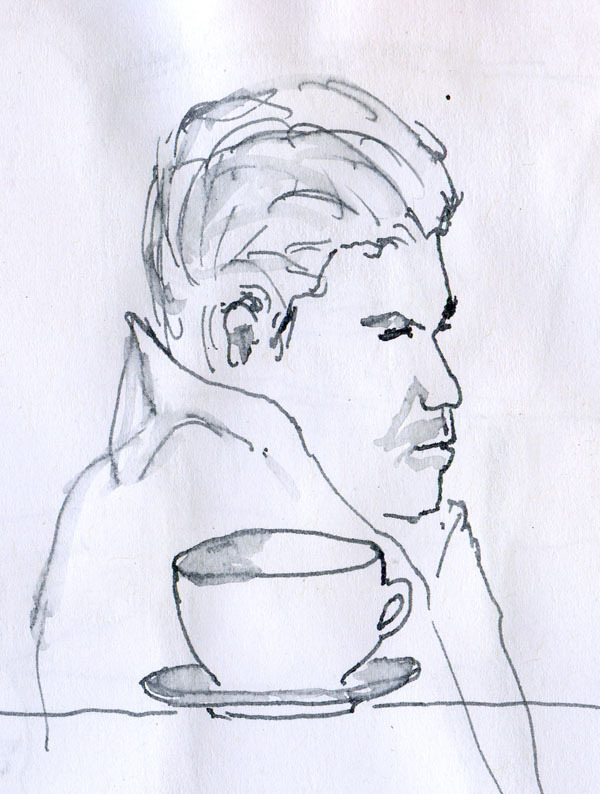 But what happened to the portraits I used to lithely and stealthily put down on paper between sips of joe? It’s like I keep saying: It’s all about practice. If you don’t, you get rusty. And as I’ve also noted before, the frustrating part is that progress is not progressive. 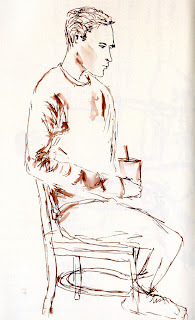 Or maybe I have a selective memory, and my portrait sketches were never as lithe as I recall. No matter – there’s a long winter ahead, and plenty of time to practice. 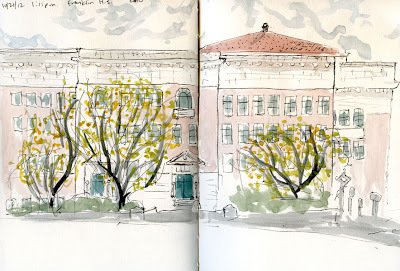 After the Columbia City sketchcrawl, I drove a couple miles north to my alma mater, Franklin High School, which celebrated its 100th birthday this year. Nearly demolished in 1986, it was designated an historic landmark and saved by widespread public protest. Although it’s been a few (ahem) years since I attended, this view looks mostly the same, other than some sculptures toward the right of the building that weren’t there. To sketch this from the car, I parked on the same street where I parked my Toyota Corolla every school day of my senior year. Even with fingerless gloves on, it was chilly, but Columbia City is hospitable to sketchers with several benches and small tables on the sidewalks. 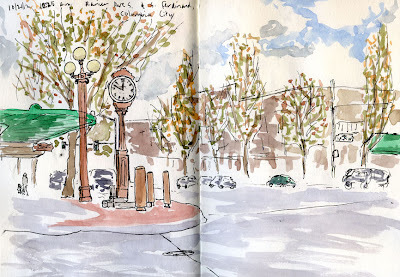 I spotted a bench across the street from an old clock that caught my eye at the corner of Rainier Avenue South and South Ferdinand Street. 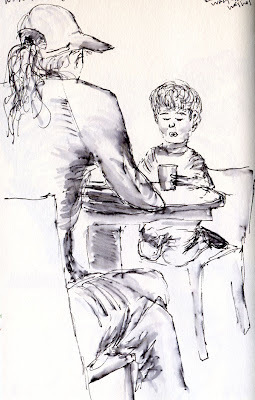 For a long time, I felt awkward and messy sketching with a fountain pen. 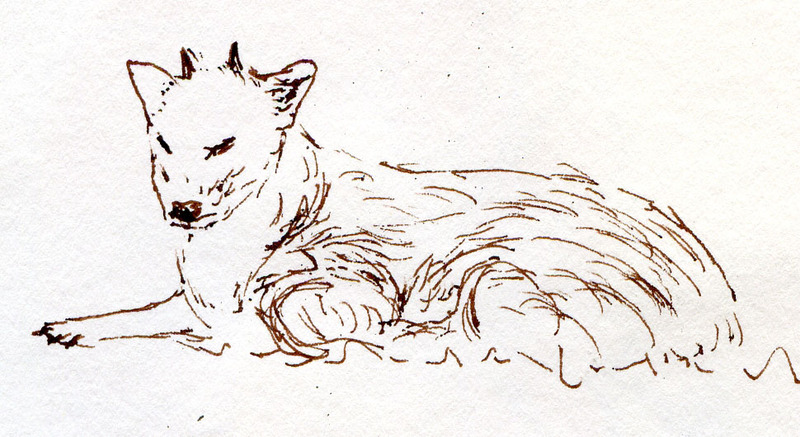 Although I’ve always loved the elegant esthetic of fountain pens, as a lefty, I couldn’t seem to manage writing with one without making a smudgy mess, let alone sketch with one. But because I knew that many sketchers use fountain pens to beautiful effects, I persisted in practicing and experimenting with various pens and inks that dry quickly, and now I’ve grown very fond of sketching with my Lamys (yes, plural – I have five so far – four Safaris and one Al-Star). Up until a few weeks ago I’d been using black ink exclusively – basic water-soluble Lamy cartridges and bottled waterproof Platinum Carbon Black. Then I started thinking that sometimes it would be nice to have a warmer shade – perhaps a sepia brown. I knew from all the blogs and forums I read that the Goulet Pen Company offers a wealth of information about fountain pens and inks, so I went there to shop for brown ink. HA! Goulet stocks no less than 78 brown inks! As a firm J on the Myers-Briggs, I get uncomfortable with too many options, and I like to decide quickly, so I was having mild anxiety. But Goulet sells small samples of almost all of the bottled inks they offer. So I picked out a dozen samples of brown inks that looked good online. 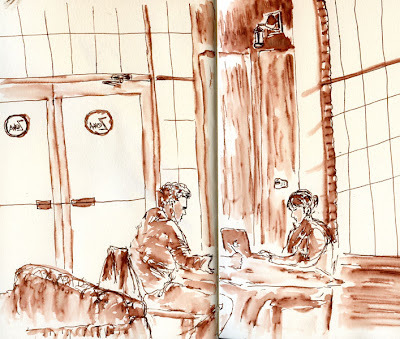 Right now my Al-Star is filled with Diamine Chocolate Brown – a lovely, rich brown that washes to a warm sepia. And speaking of Diamine, one of my Safaris is filled with Diamine Grey – which I bought a whole bottle of without even trying it first. Why the impulsive buy? 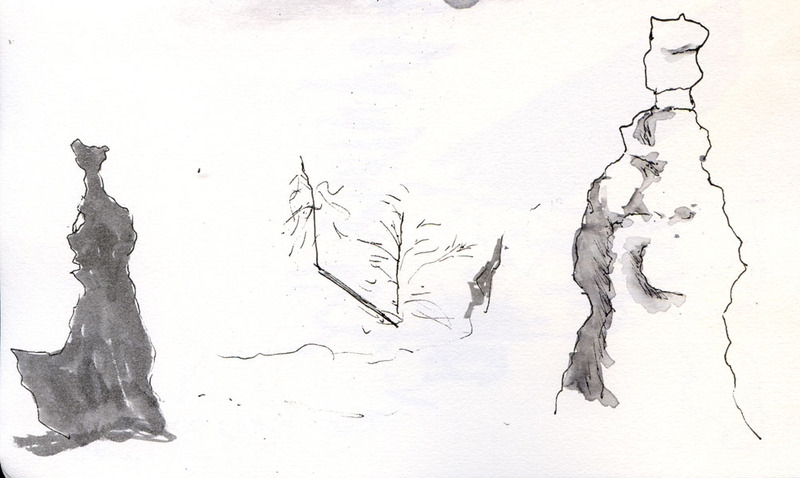 Mainly because of Stefano, writer of the delightful blog Everything is worth to be sketched, and his recent reviews of gray inks. 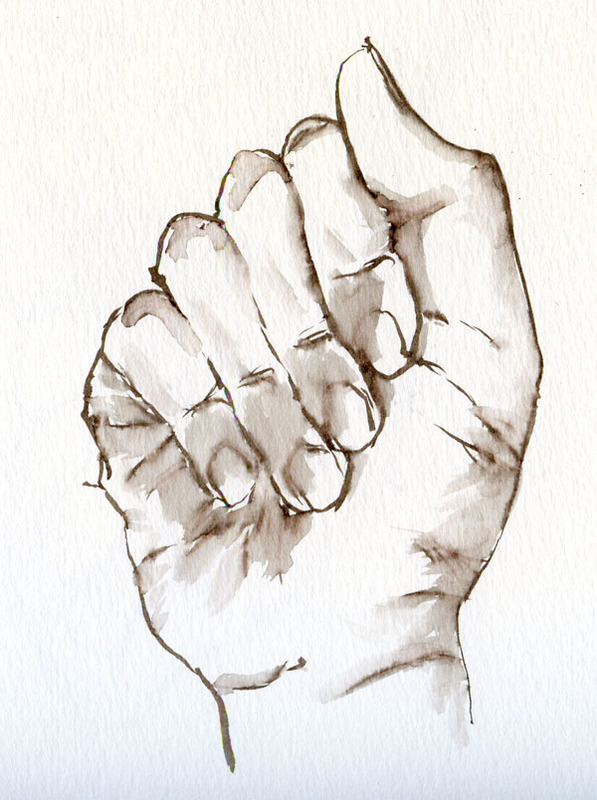 He describes Diamine Grey as a “pearl grey,” and that’s as good a description as any for this elegant ink. So I now carry four fountain pens in my bag – one with Platinum Carbon Black, one with Lamy Black, one with Diamine Grey, and one with Diamine Chocolate Brown (until the converter runs out, and I move on to the next brown sample). 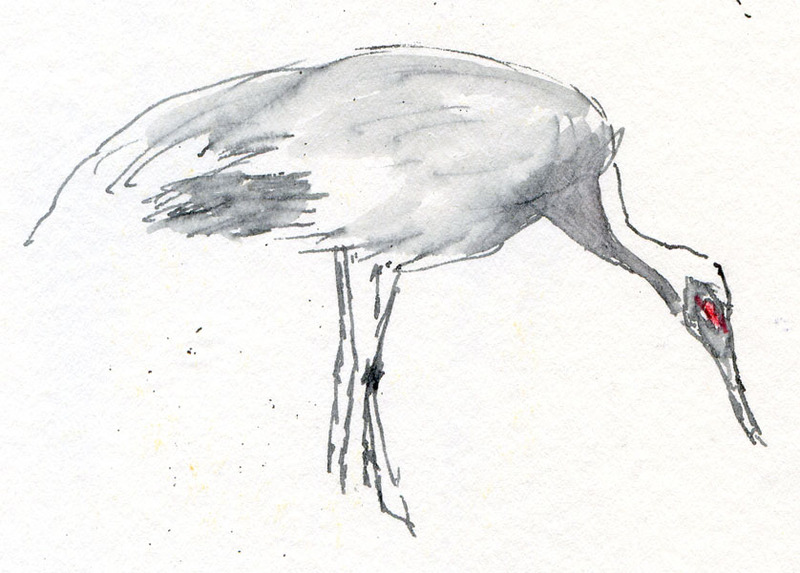 I wasn’t planning to stop at the zoo yesterday, but I knew it was going to rain tonight and continue for possibly days, so I ran in for a few quick sketches between errands. 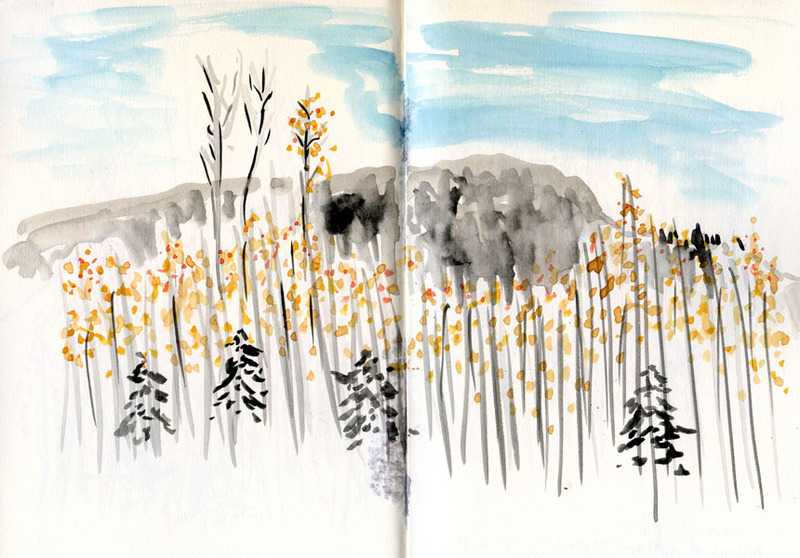 Since it was a spontaneous stop, I had only my Greeting Card Sketchbook and my Sketchbook Project sketchbook with me – both of which are too flimsy to support my attachable watercolor kit. So I decided it was a good opportunity to forego paint and use only fountain pens and, in the case of one sketch, a red water-soluble colored pencil. It turns out that you can go pretty far sketching at the zoo with only gray and brown inks. 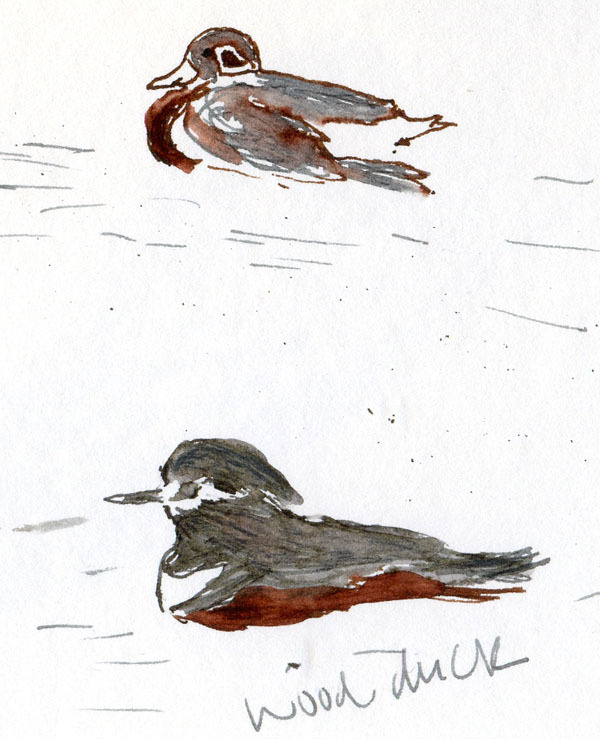 In fact, unlike the black Lamy ink, which tends to wash into an unnatural shade of purplish-gray, the Diamine Grey washes to a soft, neutral gray that many birds and mammals seem to have on their underbellies. 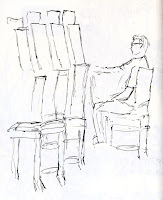 Back in June, I took an intensive figure drawing workshop to learn to “find the gesture” in a figure. Now that the weather is getting colder and wetter, I decided it was a good time to check out an open session at Gage’s figure drawing studio to see if I remembered anything from June. Indeed, even with the first two-minute pose, finding the gesture of the shoulders and hips came back to me fairly quickly. By the time we were doing 20-minute poses three hours later, I was exhausted and convinced that just because I remember how to draw lines through the shoulders and hips doesn’t mean I can draw figures! 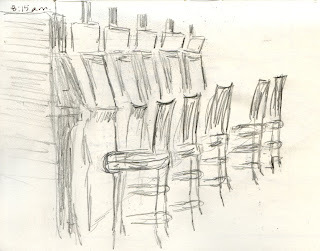 Back to the drawing board (or, in my case, the sketchbook), and I’ll definitely be back to open sessions at Gage. 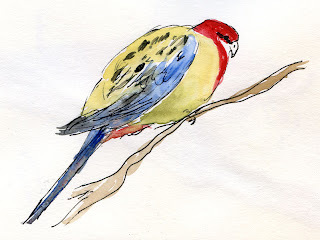 I’ve been reading Watercolour Secrets: Tips & Techniques to Make Watercolour Painting More Enjoyable, a free e-book by Bob Davies. It’s not a complete how-to, but you can’t beat the price, and I enjoy reading encouragement such as “Go on, give it a go!” by the British author. Section 6, “Creating Believable Trees,” has been of particular interest because so many of my sketches of trees end up looking like blobs. 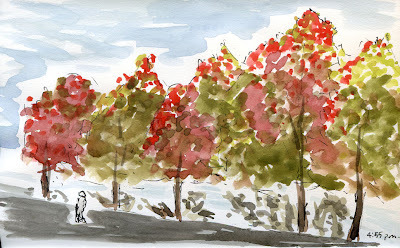 Weather.com said the rain wouldn’t be starting until about 4 p.m. At 1 p.m., with a half-hour before I had to get to my errands, I decided I had enough time to dash over to Green Lake to “give it a go” with another sketch of the amazing fall color we’ve been treated to this year. At 1:35 p.m., I was still finishing the grass when the clouds opened up and nearly turned my watercolors to water. 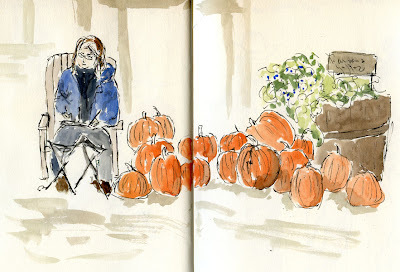 For the 37th worldwide sketchcrawl, the Seattle Urban Sketchers met at Fall City Farms in the Snoqualmie Valley east of Seattle. In the car on the way over, Jackie and I laughed at the irony of the Urban Sketchers meeting at a farm, and I’ve wondered myself about whether rural sketching counts as Urban Sketching, but why quibble over semantics? A working farm, Fall City Farms offers lots and lots of pumpkins in October and Christmas trees in December. 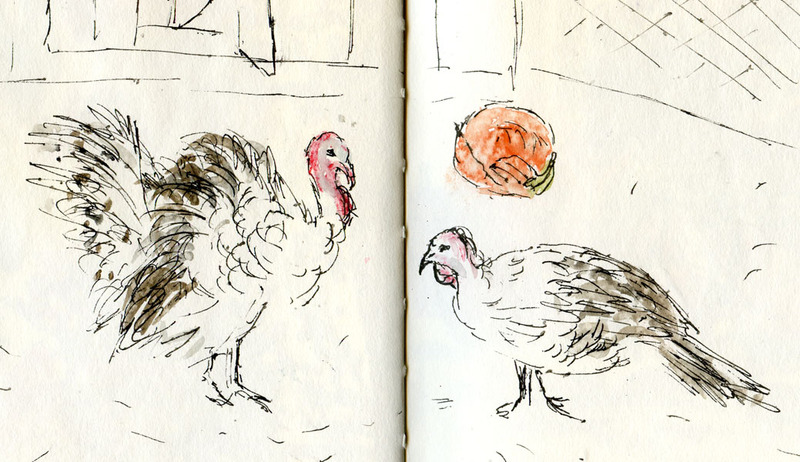 With so many festive fall scenes to choose from, I started with the turkeys until the drizzle turned into a solid shower. 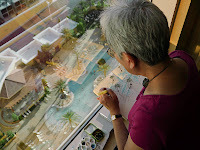 Looking for cover, I found a shelter with a good view of Stephanie (who initiated the location for this sketchcrawl – great idea, Stephanie!) sketching near a pile of pumpkins. 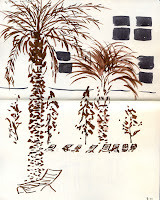 As I looked around for my next sketch, I was suddenly seduced by the scent of frying sugar. I followed it to a bag of tiny donuts – hot from the oil and covered with cinnamon sugar! 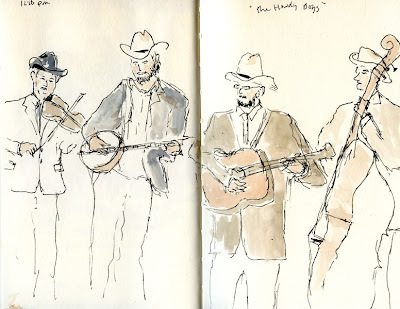 It was an awesome lunch to eat while waiting for The Howdy Boys, who play ”honky tonkin’ bluegrass from Seattle,” to set up for their performance. 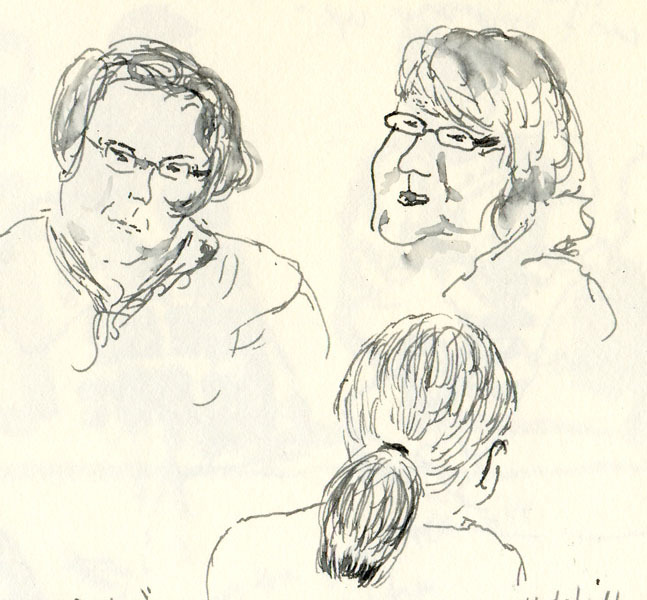 I lost track of time sketching them and almost missed the other sketchers gathering at a dry spot to spread out their sketchbooks at the end of the crawl. Where did you sketch for today's 37th worldwide sketchcrawl? Ever since I stopped using a designated “sketch bag” and integrated my sketching supplies into my regular, everyday purse, my general habit has been to carry a 5.5” square format Hand Book journal most of the time as my catch-all sketchbook because it’s a good compromise between portability and a decent page size. When I know I’m going to want more page space or higher quality paper, I grab a larger format Stillman & Birn or other sketchbooks. But as a general rule, I don’t carry my preferred sketchbooks day to day because they add quite a bit of weight and bulk to my already-heavy bag. As a result, I’ve been using the Sketchbook Project book in very un-special ways –sketches of the backs of heads on buses, parked cars while I’m waiting for my spouse-man to shop at the hardware store, etc. – exactly as I had intended. And I realized I’ve been leaving even my 5.5” square Hand Book at home when I’m just running errands or going to work because I know the Sketchbook Project book is in my bag already. 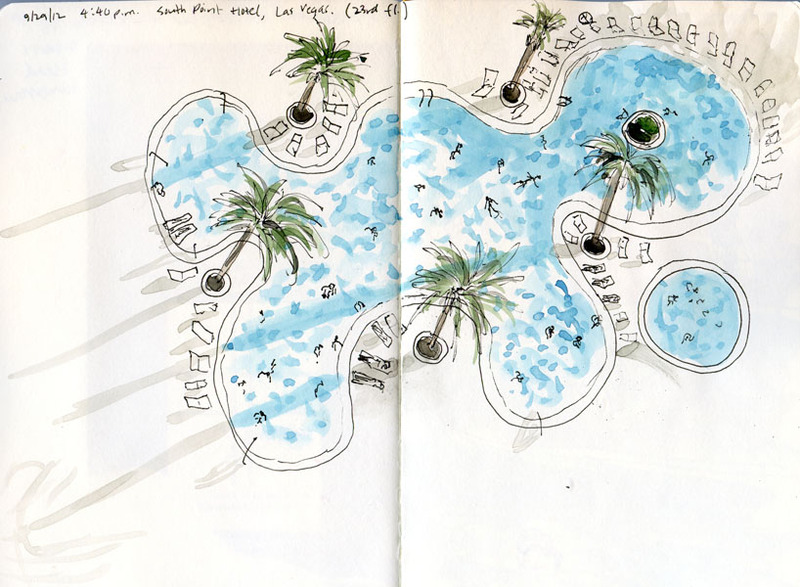 All of this prompted me to rethink the concept of the everyday, catch-all sketchbook, and I decided I need something like that very thin, lightweight, flat-opening Sketchbook Project book – but with better paper. The result: the Greeting Card Sketchbook. First off, I should say that I’m not a bookbinder. I love looking at handmade books, I’ve purchased a few handmade books, I own a collection of books about bookbinding and showcasing handmade art books and, at various times in my life, I’ve taken bookbinding classes because I love the idea of making my own books (although in practice, I don’t enjoy all the careful measuring, gluing and cutting that traditional bookbinding requires). One of my Coptic-bound books. 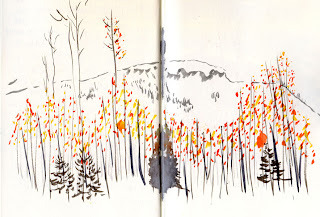 When I started sketching last year, in a brief burst of rekindled enthusiasm, I idealistically decided I would make all of my own sketchbooks for the rest of my sketching life because it seemed like such a perfect integration of media and message – hand-drawn images kept in handbound books. To that end, last winter I did a little research on binding formats that would produce a flat-opening page and determined that Coptic binding would suit me best. 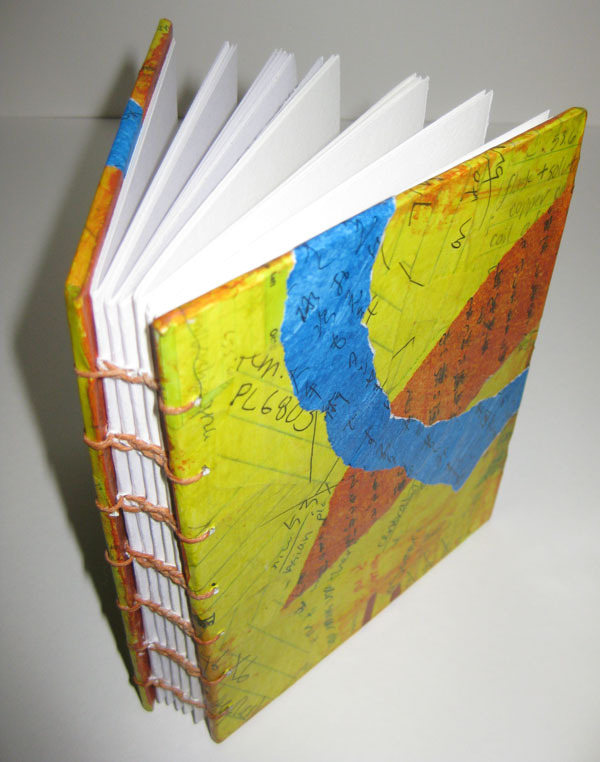 After taking a workshop in Coptic binding, I made three books that I’m pleased with. 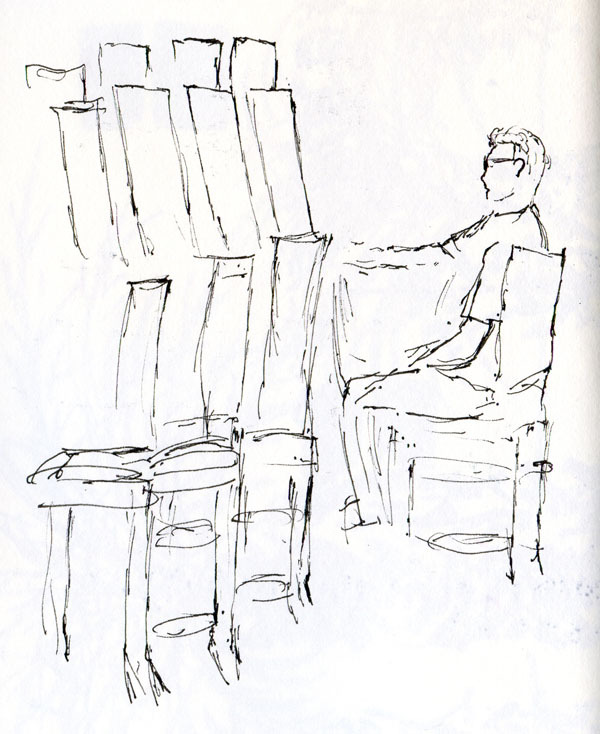 But they took quite a bit of time to make, and I realized that I’d rather spend the time sketching than making the books. However, I also learned that the process of hand-stitched bindings is a snap, so I filed that away in my mind for future reference. Fast-forward to this week, when I was enjoying how lightweight my bag is with that thin, flimsy sketchbook, and I began in earnest to come up with a simple – defined as non-time-consuming and using materials I already have – solution to meet this need. I pulled from my bookshelf Gwen Diehn’s The Decorated Journal, which I recalled had easy instructions for the pamphlet stitch binding (which, similar to Coptic, allows the page to open flat). I took a sheet of 100-pound, 18” x 24” Canson Biggie watercolor paper, which I happen to have a stack of, and tore it down to eight 6” x 9” sheets. I folded each sheet in half, yielding a comfortable 6” x 4.5” page: a fast and easy single signature. But what to do about the covers? (I had made collaged and painted covers for my Coptic books that took more time than I wanted to spend on this project.) I dug around in my box of collage materials and considered old calendar covers, decorative boxes, cardboard and other materials that could be cut down. 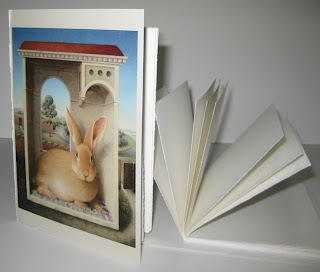 But what caught my eye was right on my desk – a greeting card with a beloved image of a rabbit from a painting by Koo Schadler (at top of page). Would it be too good to be true for the card to be the right size, without even cutting it down. . . ? It was! And a reused material, to boot! Nothing spurs me on like the serendipity of art materials, so I pulled out my bookbinding tools (that burst of enthusiasm last December wasn’t wasted after all), and in literally a few minutes, I punched and sewed up the pages and covers into a thin, lightweight sketchbook. And since I already had all my bookbinding tools out anyway, I decided to make a second one, below (the card image is from a folding screen by an unknown Japanese artist from the Edo period). This time, I first trimmed a half-inch off the full 18” x 24” sheet before tearing it down, which made the signature fit perfectly between the covers. Whether the greeting card covers will hold up to daily hauling and handling remains to be seen. 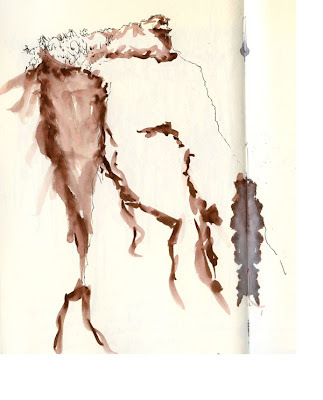 But since the book contains only 32 pages (and I’ve been known to fill a 124-page, 5.5” x 8.5” Stillman & Birn sketchbook in a month), how long does it have to last? Edited 12/19/12: I just finished filling my first Greeting Card Sketchbook, which has been in my bag continually for about two months. The corners of the covers are a tiny bit dog-eared, but because the covers extend slightly beyond the edges of the pages, the pages themselves are not worn at all. I even got a cover a little wet once, but the heavily varnished card stock held up well and wiped off clean without leaving a mark. Downright sturdy for a book made from a reused card! I'm going to go make a few more. Edited 6/26/13: The Greeting Card Sketchbooks weren’t as durable as I initially thought; see “Catching Up with the Catch-All Sketchbook” for the follow-up report. 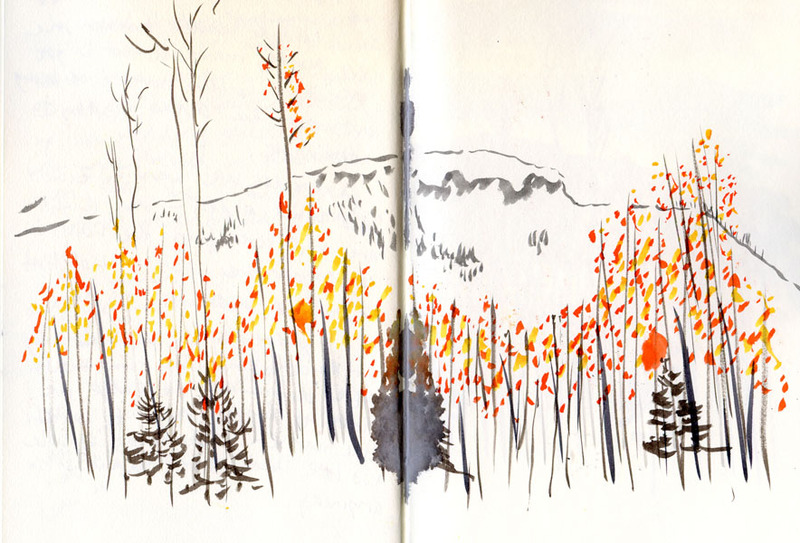 Edited 8/11/13: I’ve rediscovered the joy, value and practicality of a handbound sketchbook. 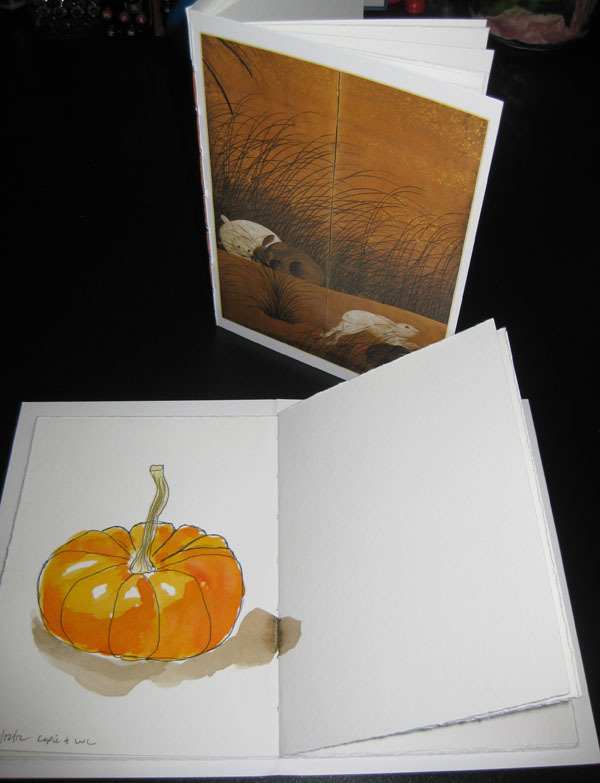 Edited 10/5/13: I've developed a refinement to the Greeting Card Sketchbook. Edited 10/20/13: Now that I’ve streamlined the process, I’m officially hooked on bookbinding. There’s no more denying it: Fall is here. I’ve been dreading the end of summer since mid-September, but the truth is, we’ve had one of the most unbelievably spectacular late-summer-through-early-autumns in years – temperatures in the 70s, sunshine and clear blue skies daily, and a nearly-record-breaking run of rainless days. Who could complain (although we soon will)? On the last beautiful day before the clouds-threatening-rain came in, I stopped by at Green Lake late in the afternoon to sketch this stand of maples wearing every variation of green, yellow, orange, red and mauve, trying to catch the sun slanting low on the very tops of the tallest trees. Pentel Color Brush Pen and Kuretake Brush Writer together (both reservoir-type brush pens with actual brush tips). Akashiya Sai and Akashiya Thin Line brush pens along with the Kuretake Zig Clean Color Real Brush marker (all non-reservoir brush pens with actual brush tips). 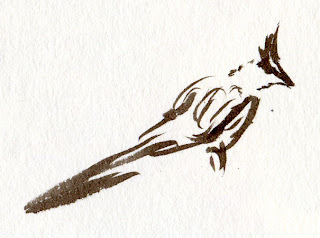 Tombow dual-brush pen by itself (this is the only brush pen I’ve reviewed that has a compressed fiber tip, not an actual brush tip, so it’s a different animal that shouldn’t be compared with the rest). 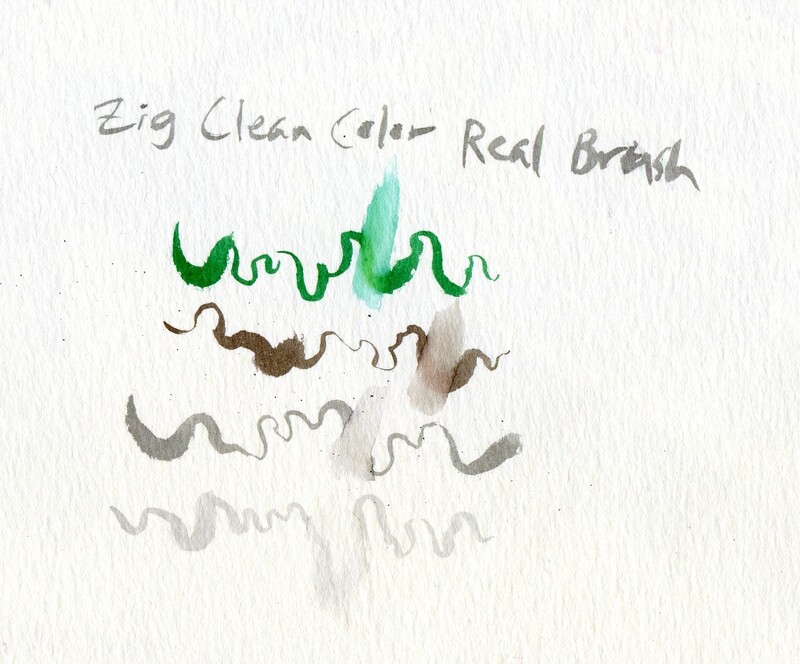 But in the interest of time and laziness, I’ll leave my existing product reviews as they are and review the Kuretake Zig Clean Color Real Brush marker here now by itself. Apparently popular with scrapbookers and manga cartoonists, these water-soluble markers come in a shorter length (slightly longer than a standard writing pen) than the other brush pens I’ve reviewed, which makes them more portable in some super-space-efficient circumstances. They are available in 60 colors – an impressive range compared to the Kuretake Brush Writer’s 24 colors, the Akashiya Sai’s 20, the Pentel’s 18 and the Akashiya Thin Line’s five (though they can’t hold a candle to Tombow’s 96 colors). After paying more than $8 each for Kuretake Brush Writers, I figured that the Zig Clean Color marker at less than $3 each would have an inferior brush tip or some other flaw. I am pleasantly surprised to find the Zig’s tip to be just as sensitive and, in some cases, better able to render a very fine line than its Brush Writer brethren. In fact, because the Kuretake Brush Writer’s ink is dispensed from a reservoir that isn’t always easy to control, the flow can be unpredictable. While less juicy, the Zig’s consistent flow results in an easy-to-control, fast-drying line. Because I wasn’t expecting to fall in love with Zigs, I bought only a small range of gray shades and a green (a first for me! I usually snap up all the purples, reds and lime greens first in any color medium I’m trying), thinking they would be good for quick gestural sketches and times when I need to distill an overwhelming scene. 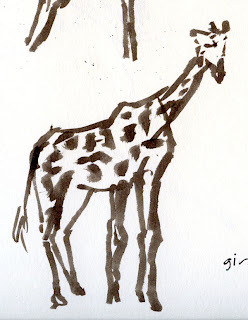 They proved to be exactly that when I took them out to the zoo for a couple of quick sketches of a giraffe and a speckled mouse bird (top of page). Note the fine Mohawk-like feathers I was able to capture with the Zig’s brush point. Similar to the other Japanese brush pens I reviewed, the Zig contains water-soluble ink that washes well for shading (see hand at right). After using all of these Japanese brush markers for several months, I’ve come to appreciate the types with actual bristle brushes rather than compressed fiber tips. More flexible and sensitive, real brush tips are simply better able to deliver a wider range of line widths, so they can paint as well as draw. However, if you’re practicing modified blind contours as I am, you might want to stick with harder, inflexible media. The soft, flexible tip on the Japanese brush markers that I value in other types of drawing is practically “invisible” to my hand when I’m not looking at the page, so my blind contour line is even more unpredictable than ever. One underrated advantage of the Zig (as well as of the two Akashiya markers, which are also non-reservoir) that I didn’t know about until last week is that it is not sensitive to high-altitude changes in air pressure. Open a Kuretake Brush Writer cap at 10,000 feet, and you will understand why this is an advantage. Edited 4/26/14: Read the results of a longevity test on Zig Clean Color Read Brush markers and some philosophical comments about lightfastness and sketching. Of the three U.S. national parks I’ve hiked (I have many more to go on my growing bucket list), Bryce Canyon is by far my favorite. Its mysterious hoodoos, amphitheater shape and bright red limestone are practically intimate compared to Grand Canyon and even Zion. 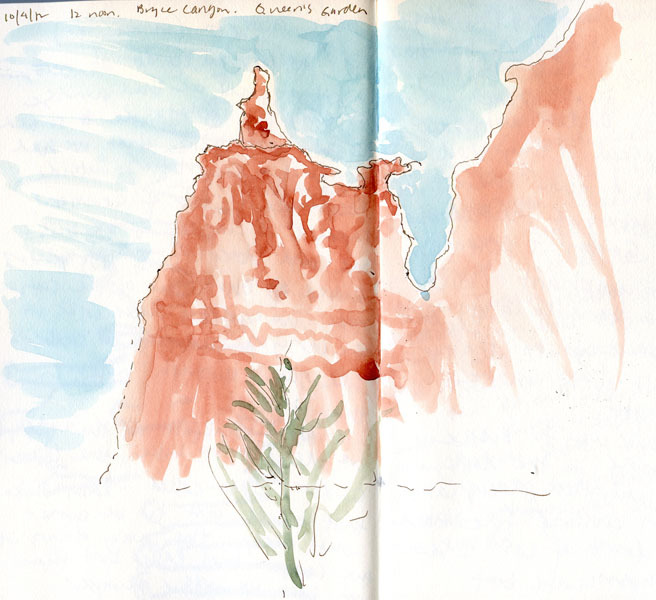 The first day, we explored the rim, and I found myself too overwhelmed by the beauty and strangeness of the vistas to manage more than a few rough sketches (below). The second day we decided to hike down into the canyon by way of the popular Queen’s Garden Trail, where the hoodoos were close enough to touch, and every turn on the trail brought another new and amazing view of this extraordinary geology. By the time we finished the hike, I was disappointed to learn that it descended only 320 feet, because it sure felt like more. But I felt a strong sense of satisfaction sketching the Queen herself (above) looking down from her throne at her sweating subjects. At 10,000 feet, Brian Head, Utah, is mostly a ski resort town, but on the last day of September, the slopes were covered with gold and orange aspens instead of snow. Feeling better after recovering from a short but nasty bout with altitude sickness, I took a late-afternoon walk to sketch the property around the condo where we were staying. The sketch above was done with watercolors, but my first try (below) was done in Kuretake Brush Writers. One thing I learned on this trip to Utah canyons is that my body is not the only thing affected by high altitudes: The Rorschach-like blob you see at the center of the sketch is where I had an incident with a brush marker releasing pressure when I removed the cap. 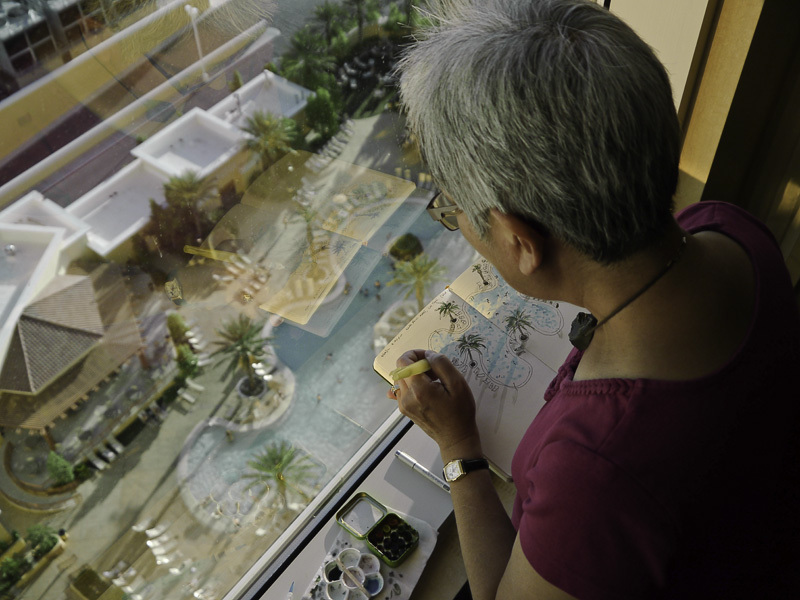 ﻿﻿﻿﻿﻿From our room on the 23rd floor of the South Point Hotel and Casino, I had an unusual view of the hotel’s pool. 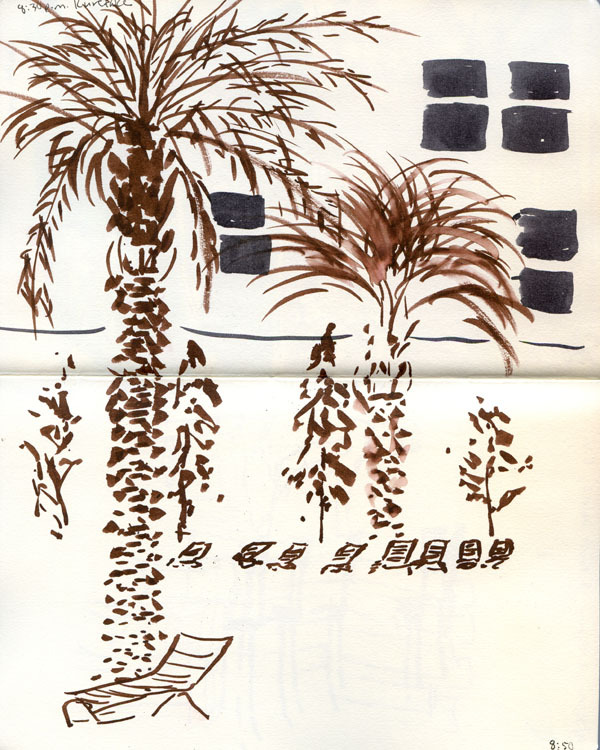 The palm trees growing poolside cast long-reaching shadows in the late afternoon sun. 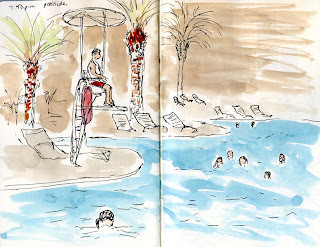 That evening, more interested in sketching than in pumping a paycheck or two into a slot machine, I stayed poolside to sketch the lifeguard, a few swimmers and more palm trees. We spent a night in Vegas on our way to canyons in Utah. I’m not much of a gambler, but I found myself hypnotically dazzled by all the lights, sounds and perspective studies in the casinos. 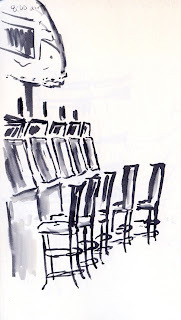 Relatively quiet at 7:45 a.m., a Seattle’s Best Coffee gave me my morning caffeine as well as an ideal view of a row of slot machines. Initially interested in sketching the man lethargically punching a machine (#1), I soon realized that I had gotten the perspective all wrong. 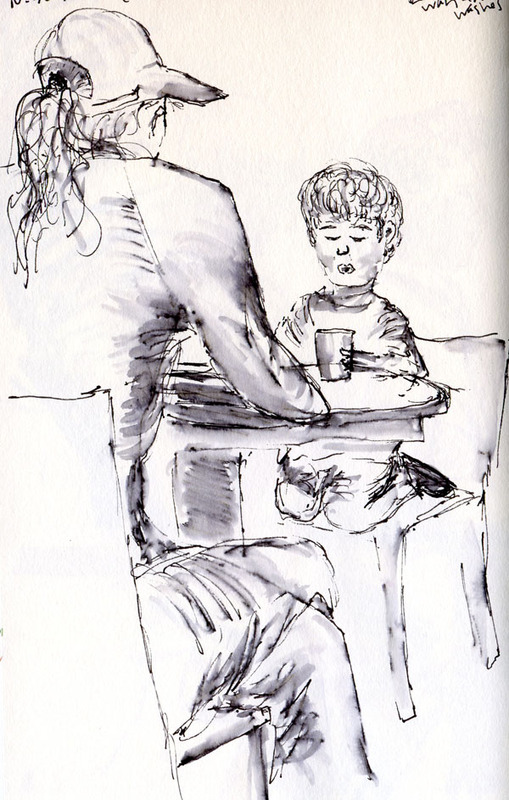 He gave up quickly, but I didn’t – I tried again with a brush marker (#2). 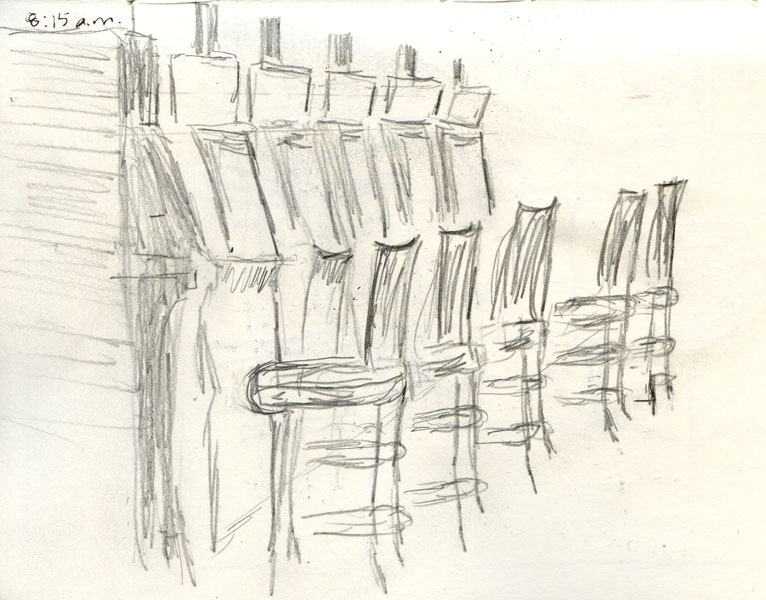 The chairs were starting to look right, but then the tops of the machines were wrong. With only a few minutes to go before I was to meet the rest of my party, I think I finally got it right, this time in pencil (#3).